Each year, thousands of people die while waiting for the gift of life—a new organ. By registering to be an organ donor, you have the potential to save lives. Each day, 78 Americans receive an organ donation to save their life. Unfortunately, 100 people die every week while waiting on the transplant list containing over 100,000 other names. Not only can organs be used, but each deceased donor can also provide hip joints, corneas, bones, connective tissue, blood vessels and skin to those in need. Patients awaiting a transplant are ranked based on medical urgency and length of time waiting. Each patient is matched to a donor using different factors, including blood type, to reduce the likelihood of organ rejection by the body. Although it is not easy to talk about death or the possibility of becoming a donor, it is important to talk with your family, friends and doctor about your wishes regarding organ donation. Registering yourself as an organ donor will not affect your medical care should you become ill or injured. All efforts will be made to save a patient's life regardless of their donation status. I saw this from aways off and thought, "Is that how fast we are going? Can those things actually tell how fast TerraTrikes are going?" Well, I guess they can! That's how Kentucky used to be spelled before it became a state. Interesting state trivia, eh? We thought there should have been a bigger sign for this monumental moment, and around the corner there was, but it had a HUGE puddle in front of it. Since there was no one else around to take the picture, I had to set the camera on the trike and use the timer function on the camera. As you can see, I got there a little late. Good thing it takes three pictures! Eeeeeeek!! This fell from the sky and landed right next to me!! I think a bird had it and dropped it, or it fell from higher up in a tree or something. Scared me. :) A few miles later the terrain changed and we were on the edge of some serious drop-off ledges. The ride was mostly UP and through some very rural areas. There were LOTS of loose dogs but we only had to use the air horn once and didn't need the pepper spray at all. The roads were narrow and these are apparently street legal in KY. We saw LOTS of them driving on the roads and even filling up at the gas stations. We ate here - The Rusty Fork Cafe. Excellent desserts and service! We got SOAKED on the ride to the Breaks Interstate Park, but it was sooo worth it. The views there have been by far the most amazing so far. Super-spectacular! If you look closely, both of us have our eyes closed. Special moment. Poor little George wanted to ride too but this was as close as he got. This happens pretty much everywhere we go. I love it. :) It makes it easy to get people talking to us which leads to conversations about organ donation. America (Amy for short) said she talked to her kids when they asked her why we were riding, and that they all said they would be donors. Good kids! Herbie LOVED riding and even though he was short he was GOOD at it! TerraTrike is Giving Away a Cruiser! Live without your car for 30 days between the dates of May 15th and July 15th. Contestants will keep an online diary of their daily challenges, adventures, and milestones, and one participant will take home a new TerraTrike Cruiser! Participate (or just follow along) by signing up for a free BikeJournal.com account and join the group entitled ‘2010 TerraTrike Car-Free Challenge’. Then simply log your trips and keep a diary of your progress. The winner will be chosen at random. So make your plans now to park that gas guzzler for 30 days and join the challenge. Can YOU do it? When we rolled up to the Methodist Church we felt instantly welcomed. They had a sign up for cyclists that told us to make ourselves at home, so we did. They had more food in there for us than any other stop so far! Elk Garden United Methodist Church. Often there are cemetery's behind churches, but this cemetery only had one grave in it. There was a woman buried here, wife of someone, but no husband grave to be seen. This was the nearby school where we got online. Our second night there at Elk Garden we were SO BORED when suddenly the door opened and some people came in. Before you knew it the place was full of Boy Scouts! They were working on the American Heritage badge and were watching movies. They spent the night in the chapel and we all had breakfast in the morning. It was then that I learned that one of their friends, a 16 yr old boy, had recently received a heart transplant! Patrick, one of the boys, is the recipient's best friend and was wearing a Donate Life shirt! WOW! Patrick in his Donate Life shirt. Us with all the scouts, and Dawson, another cyclist who stayed there too. Every one of these kids and the grownups too, rode our trikes. I have too many pictures to put them all here. FUN STUFF! Elk Garden certainly made us feel at home. They've been hosting cyclists for 30 years! Thank you Elk Garden and the Boy Scouts! We rested here a bit, ate some PB2 and then headed DOWN the other side. Weeeeeeeeeeeeeeeeeee! Damascus is a really different kind of town. There were like-minded folks milling about everywhere, wearing shorts, needing showers, looking a lot like us minus the trikes! Yep, hikers. The AT runs right through "Trail Town, USA" and this town looks as though it was made just for them. 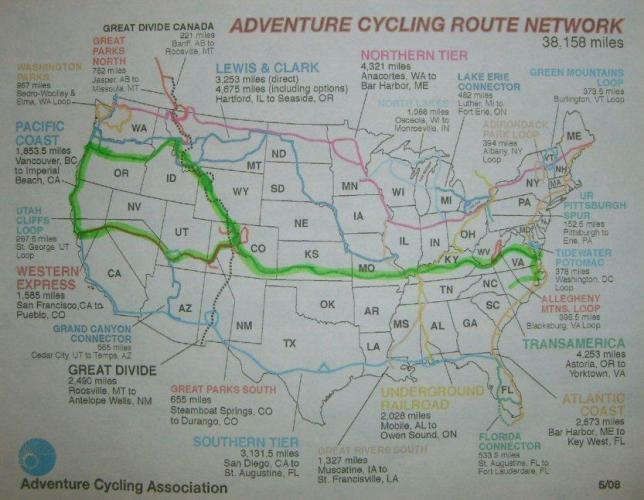 Hostels and restaurants that serve really large portions, and several bike rental places for folks who want to ride the Virginia Creeper Trail. We liked it there, but were happy to get back on the road where we are most happy. My new shoe straps - velcro watch bands. They work great! Thanks for the idea Mark. We will still go clipless soon but for now these keep me safe. Susie, the owner of the B&B where we stayed. She was so much fun to meet! Li'l Grim getn ready to go. Notice how short my flags are? One of them broke in a really strong wind and it flew off my trike. Ken walked back a good ways and got it for me and now I am using old tent poles as flag poles. Hey they work! This is Qunicey's. We went there for lunch with Lu and Larry, and then a few hours later went back for desserts. Ken had their famous Apple Turnover and I had a hot fudge brownie. Both came with ice cream, our favorite dessert so far on this trip. Other than cheescake maybe.